So How Does Food Heal? Or Does it? Can food heal your body? It’s a good question. 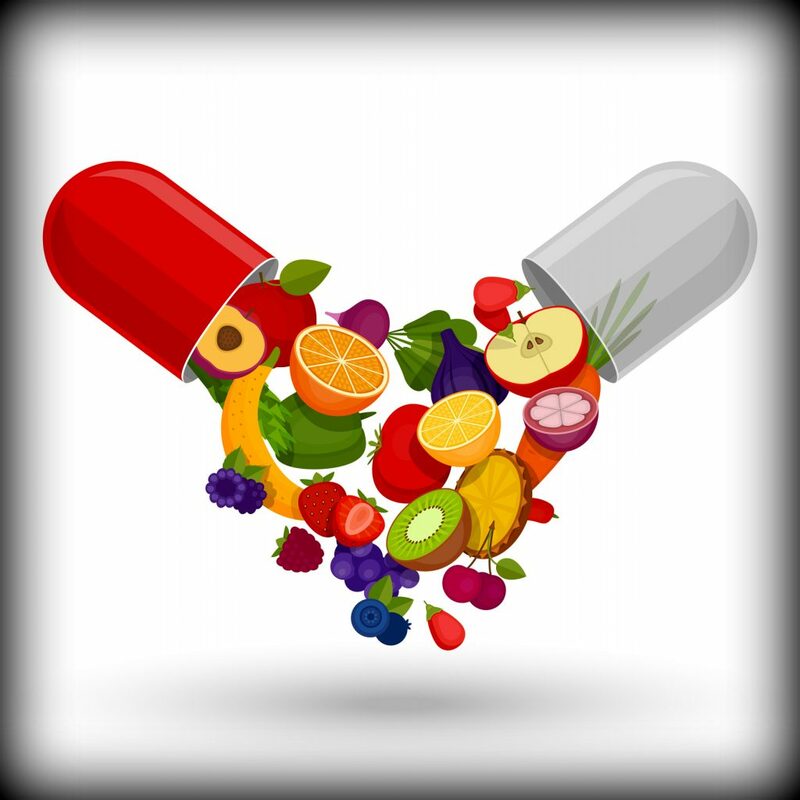 I used to have a website with the tagline: “Let food be your medicine and medicine be your food…Hippocrates.” As I mentioned in my last article Food as Medicine, my focus at the time was on how food can prevent disease and sickness. My philosophy is also that food must taste good. It must draw people to want to eat it. So many of us grew up to think that if it is good for you, it probably doesn’t taste good. I’ve made it a goal through my life since I was 18 to contradict that notion with every meal I prepare. I didn’t succeed every time, but I gave it a good try. Let’s Tackle the Question: Can food heal? Check out the magazines in the grocery aisle. I can’t think of a single week that I don’t see at least one article on the cover of a magazine telling us something about food and health. They’re a little light on research. Something like, “drink such and such tea and lower your cholesterol.” Then they say something about “a study showed” and then provide some stats. Rarely is the study actually named. It might give details like “a study at such and such university.” I don’t doubt the facts presented, but it’s difficult to check out if we don’t know how. Do we just trust people to have interpreted the results correctly, or do we want to know for ourselves? In a future article, I’ll demonstrate how to find and understand a research study. 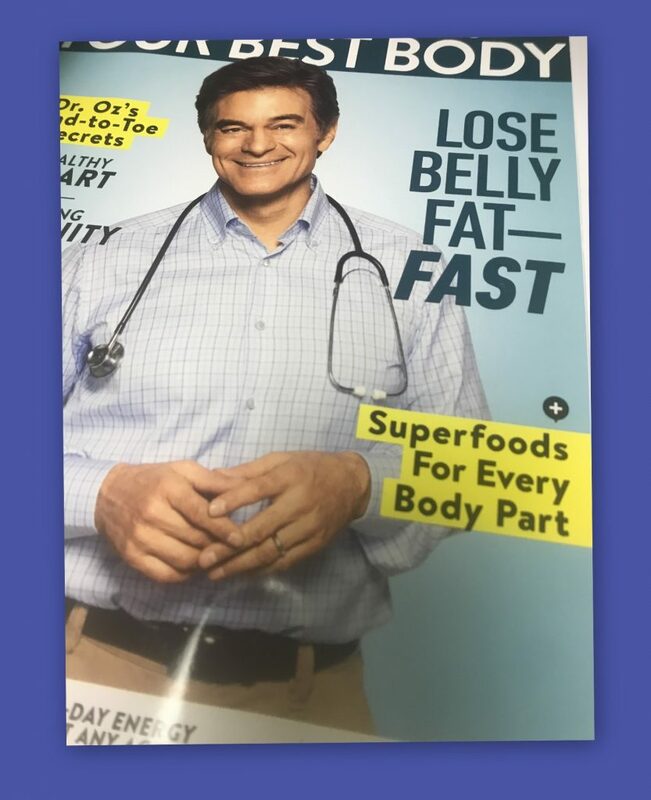 Here’s an image from the front cover of Dr. Oz magazine back in December. Inside the magazine, body parts are listed with foods that nourish each. My thoughts on this are mixed. My heart and my hands are both muscle tissue, nervous tissue, connective tissue, and more, and are connected to every body system in some way. We aren’t just a heart or a brain or a pair of eyes! We truly are whole. We need to nourish the whole self, not just our eyes. How is this information supposed to help us? If we overload on a food that is supposed to help one body part, then will we end up with an imbalanced diet? The concept of food to health is ubiquitous, yet we have no idea as individuals how to put it all together. We know certain foods prevent disease if we create a healthy diet for ourselves with an abundance of those foods. But can foods heal once disease sets in? What is a “medicinal” dose of food, and is it possible to eat that much of it? I’m asking a lot of questions here, but there are answers to these questions, and there are experts you can talk to. Bear with me! The handbook for the Gerson Therapy for healing chronic disease and cancer has a list of grocery items needed for one week for a Gerson cancer patient. At the top of the list is 50 pounds of organic carrots. I don’t know if the website Healthline.com is a credible source. If someone has a better source, please let me know. But here is what they have to say about carrots. If you scroll down a bit in the article, you will see that they claim carrots help prevent cancer. You can see a list of the nutrients found in carrots. You can also see that it is low on the glycemic index. In Gerson therapy, carrots play a large role, as you can see. So how does a person ingest the nutrients and enzymes of 50 pounds of carrots in one week? You can buy beet powder and carrot powder and supplements made from whole foods, but you’d have to do an awful lot of unpleasant swallowing, and you wouldn’t get the fresh enzymes. The Gerson cancer patient drinks an 8-ounce glass of fresh pressed juice every hour of the day, and all but two include carrots. Carrots are also included in the special soup that they eat each day. Another big item on the grocery list is 40 pounds of organic apples. Apples are juiced with some of the carrot juice and the one green juice per day. For people who are sick and who have trouble digesting, it is difficult to get nourished. Juicing solves that problem by providing the nutrients without the bulk. Bulk is provided by the special soup and other foods that are prescribed in the therapy and prepared in a way that is easy to digest. What I’m getting at here is that to use food as medicine for any condition, we need a trained human guide. We can try to figure it out ourselves, but time is important when disease has set in. Gerson therapy is intense and probably cannot be done solo. Most people on the therapy have a full-time helper. I’ve been experimenting with it, and I am not sure a person can do this therapy without a helper. I know of one group of people who are renting a house together to share the services of one helper, buy produce in bulk, and to help each other — a unique solution. There are Gerson practitioners, but many families do the therapy without a practitioner by using the educational materials from the Gerson Institute. If you want to learn more, check out the Gerson Institute website. There is also a Facebook support group you can join to ask questions. The Gerson Therapy is not the only place you will find food being used as medicine. A quick search brought me to Dr. James S. Gordon’s website, in which he describes a program he created to teach doctors and others how to heal with foods. The article provides a link. I recently became aware of a new approach some doctors become trained in to help people heal holistically through a systems-biology based approach. It’s called functional medicine. It is very interesting because it differs from the medical model we’re used to — which I often hear people complain about. We go to the doctor, and he makes a diagnosis and writes out a prescription or prescribes surgery. So, what if we gathered around the juicing station (kind of like the water cooler or coffee pot)? But wait — there aren’t any. So I’m experimenting with juicing at the office. It’s a pretty messy enterprise, to say the least. But suppose there was a juicer at work and people walked over with their carrots and their cup. It takes just three minutes to make one cup of juice. The challenge: Convince your employer to try it for one month, and if that’s a problem, try one week. 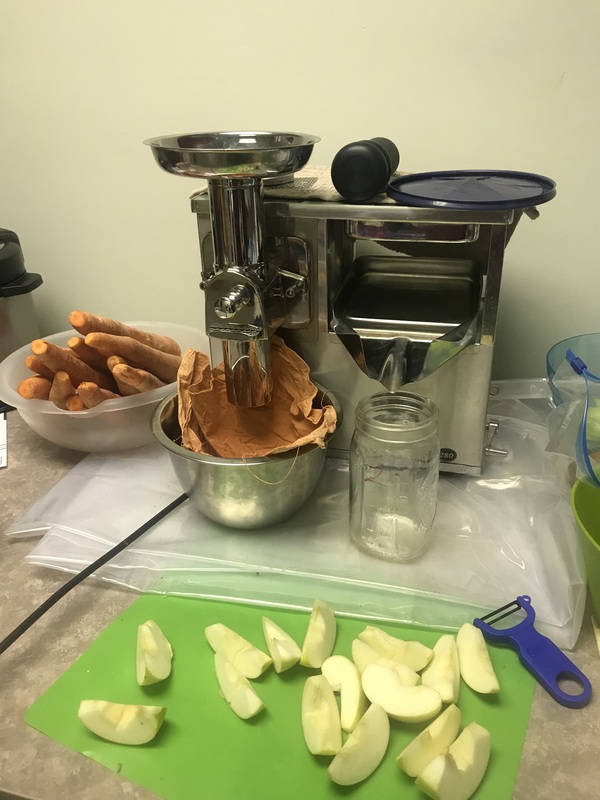 Someone brings in a juicer and sets it up somewhere. Provide a pail for the compost. (Maybe a local farmer or gardener will want it.) Take pictures of people drinking juice at the juicing station and post it on Facebook or other social media. Provide a link to this article. So, what do you think? Can you take the challenge?